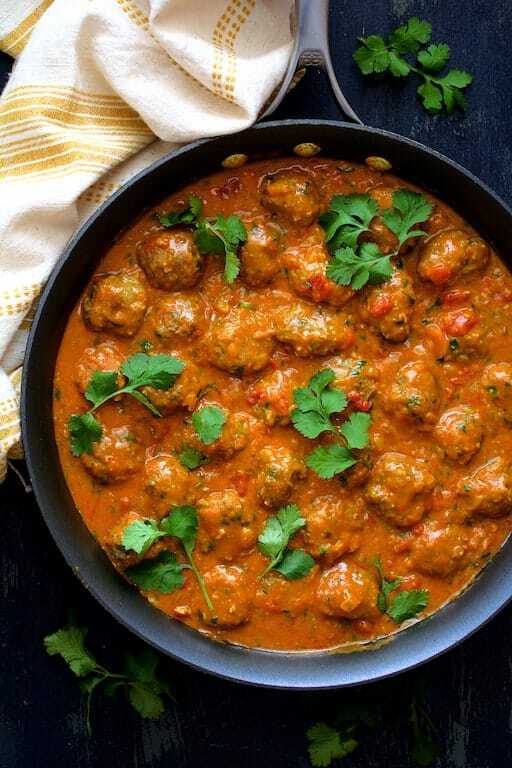 Meatballs in Spicy Curry can be made with any protein! 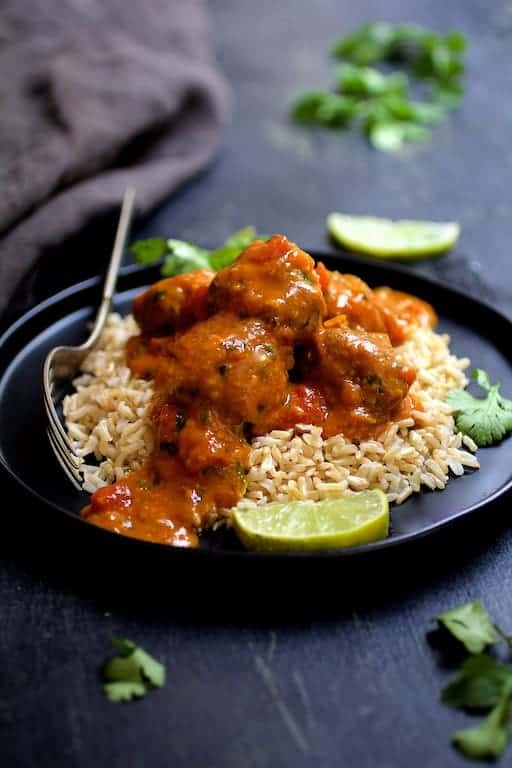 Try beef, lamb, chicken or turkey meatballs smothered in this amazing spicy Indian-inspired sauce! I pretty much got three things done this weekend. I got 2/3 of the house decorated for Christmas, I did laundry and I made these Meatballs in Spicy Curry. We had a few Thanksgiving leftovers in the fridge and frankly, I couldn’t stand to look at them anymore. My husband very unenthusiastically said…”I’ll eat them.” Basically, that means he’ll take one for the team so they don’t get thrown out. 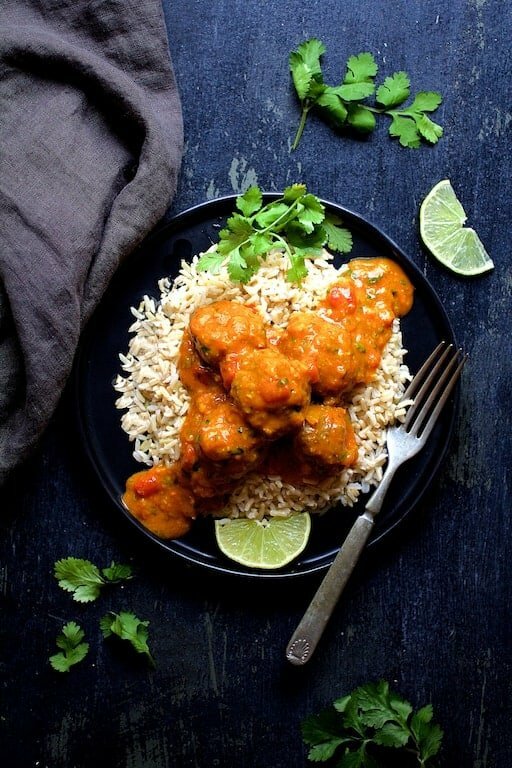 Something crazy different like Meatballs in Spicy Curry was definitely in order! Let’s talk about these little morsels of meaty goodness! Make them with any type of ground meat: Beef, lamb, chicken or turkey. Pork? Sure. When making meatballs, get all the ingredients except the ground meat mixed together first, then add the ground meat. This ensures all the ingredients–especially the seasonings–are evenly distributed. When I mix up any ground meat dish, I wear disposable gloves and mix with my hands to get the job done faster and more thoroughly. I like to drizzle a little bit of broth or stock over the meatballs before baking. This keeps them from drying out and they stay super tender! 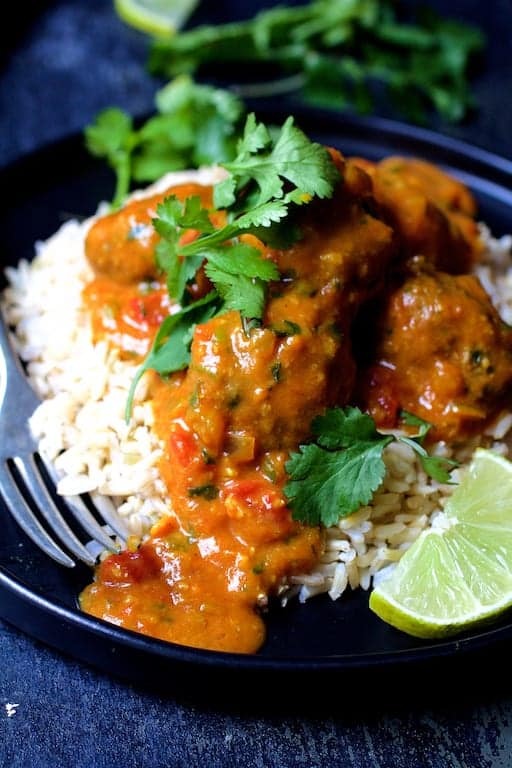 Serve the meatballs and sauce over brown basmati rice. OMG, brown basmati rice is so flavorful and aromatic! You’ll love the aroma in your home while you’re getting ready for the holidays! Time to get back to my Christmas decorating! At the rate I’m going, I’ll probably be finished in time to take it all down. Enjoy! MEATBALLS: Preheat oven to 375 degrees. Line a large baking sheet with aluminum foil and spray with cooking spray. Heat coconut oil over medium-high heat in a large saute pan. Add onion and cook 8-10 minutes or until onion is softened. Transfer 1/3 of the onions to a large bowl. Leave remaining onions in the saute pan and set aside. While the onions that you placed in the bowl are still hot, add garlic, ginger, cumin and curry powder and stir. Cool to room temperature. To the cooled onions in the bowl, add cilantro, panko, 1/4 cup beef broth, egg, salt, black pepper and mix well. Add beef (or protein you're using) and mix well again. Using a large cookie scoop, form mixture into approximately 36 even meatballs. Place on prepared cookie sheet. Drizzle with remaining 1/4 cup beef broth. Bake for 20-25 minutes or until center of meatballs registers 165 degrees on an instant-read thermometer. SAUCE: While meatballs are baking, heat onions that you left in saute pan back up over medium-high heat. Add garlic, ginger, curry powder and flour and cook 1-2 minutes. Stir in beef broth, tomatoes and tomato paste. Bring to a boil, reduce heat and simmer 15-20 minutes or until thickened. Add coconut milk, cilantro and salt and black pepper to taste. When meatballs are finished, add to sauce, stir gently to coat. Serve over hot cooked basmati brown rice. Garnish with cilantro sprigs and lime wedges. INGREDIENT NOTE: The large onion will be used in both the meatballs and sauce. Cook the entire onion in the coconut oil, then divide. Thanku so much for introducing such a fun twist on meatballs! I loved the incorporation of madras curry powder as I’m very fond of Indian masalas. One thing that I added was garnishing it with a teaspoon of dried fenugreek leaves. I rubbed the leaves between my thumb and index finger while scattering them all over the meatballs…it turned out to be delish!!! Thanks so much, Nazish! So glad you enjoyed! Dried fenugreek is something I haven’t used very often but now I have a reason to and give it a try over these meatballs. Thanks again and please stay in touch! Hi, Maryann, Can you be more specific? Thanks, Alida! You made my day! Please stay in touch! Hi, Courtney, Thanks so much for pointing out that the beef was not included in the directions. I apologize for any confusion and take accuracy very seriously! I tried to clarify about the onions because I could see where that would be confusing. Rather than cooking the onions twice, I wrote it so that you would cook them all at once, then divide. I had my husband review this recipe after making the changes so hopefully, two brains are better than one this time! If anything else is awry, please let me know. Thanks again and thank you for being kind about it. Thanks, Michelle, Hope you enjoy! This looks so amazing!! Oh my goodness! I’m so making this this week! Printing this off now!! I have never posted comments to any site. I just want to say you are real! I can see the love and passion you place into each recipe. I have made several recipes and they were perfect. Thank you. Wow, Linda, thank YOU so very much! You really made my day! Wonderful people like you make doing this all worth it. Have a great holiday season and thank you again. Please stay in touch. Whoa! These look delicious! I would have never thought to serve meatballs in curry. I have spaghetti and meatballs pretty much hardwired into my brain. Will have to try this. I love curry. The hotter the better! Thanks, Jenna! 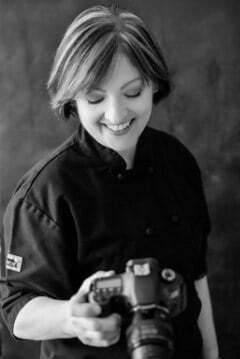 I love to put meatballs into new and creative sauces!